One of the many reasons for slowed PC speed may be heavily fragmented hard drives. Auslogics Disk Defrag is a light and fast defragmentation utility that is compatible with FAT 16/32 as well as NTFS files systems. You can use this system tool to defrag files, folders, and individual drives to increase read/write speed and overall drive performance. It is powered by hybrid disk optimization techniques that come up as a solution for the stagnant speed of your PC. It also reduces the frequency of hangs, crashes and error messages on Windows. Simply ask this cleaning and tweaking utility to analyze your hard disk to test its defragmentation level. The application is incredibly fast to do the process and reports by with a map of your hard disk showing the percentage that’s defragmented. Auslogics Disk Defrag for Windows also recommends whether your system’s hard disk needs to be defragmented or not. Graphical representation of the defrag process offered by the application makes things much easier to pursue. Auslogics Disk Defrag comes with an ultra-fast engine and often takes less than even 10 minutes to defrag an average size computer hard drive. The application is available in both free and pro version with comprehensive functionality. The free Auslogics Disk Defrag solves all the problem of your PC performing sluggish by scrutinizing through your hard disk, searching fragmented file and then defragging them so that all the files can be opened quicker. 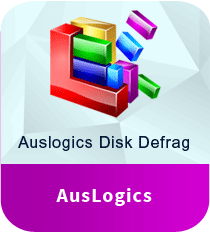 If you want more and more control over defragging then simply download free Auslogics Disk Defrag and get the maximum performance from your expensive hardware. Auslogics Disk Defrag is proven, safe, and efficient cleaning and tweaking utility that is used by over millions of users around the world and is recommended by industry experts.